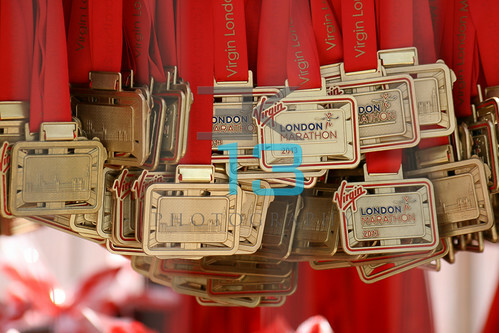 A series of images taken during the 2013 Virgin London Marathon. 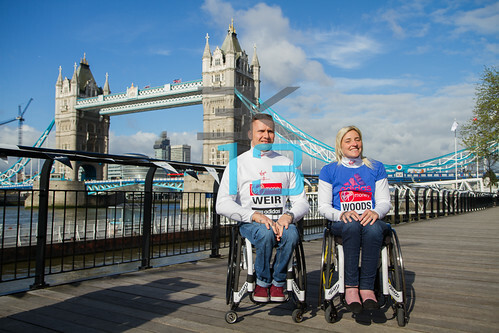 On 19th April 2013 was the Press Day for the Paralympic Athletes taking part in the marathon and those who dared run the marathon in costumes in order to break the Guinness Book of World Records. 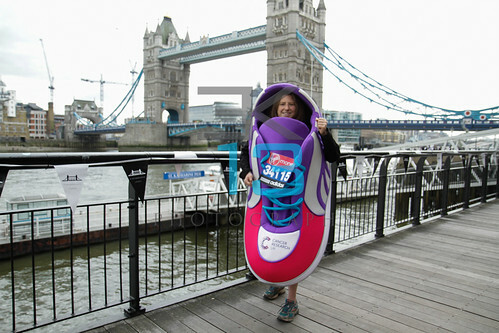 Lucy Barney will attempt the Guinness World Record for ‘fastest marathon dressed as a shoe’ during Sunday’s Virgin London Marathon raising money for Cancer Research. On marathon day, 21st April 2013, elite runners, celebrities, record breakers, charity runners, etc., took to the streets of London to take part in one for the most recognised events of the sporting calendar. This year’s event was special as it came in the wake of the Boston Marathon bombings that happened weeks prior to the event. As a show of solidarity, the Virgin London Marathon we ahead without any major incidents reported and with record crowds cheering on the runners along the route as a show of defiance and support for a the greater good of mankind. 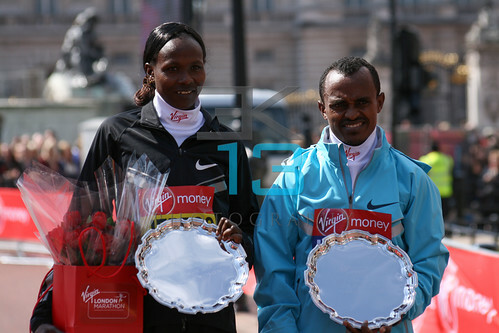 London Marathon 2013 winners Priscah Jeptoo and Tsegaye Kebede on the podium after being presented for winning the marathon. Of all the images I took on the day, this one of Tsegaye Kebede has got to be my favourite. It just sums up the feelings of the day. 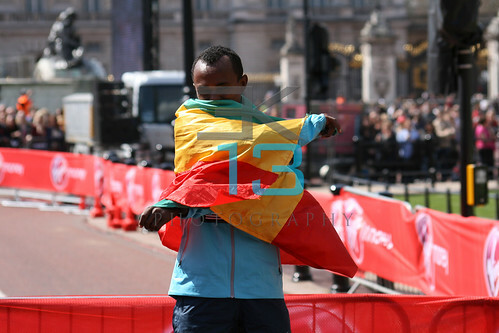 Elite men athlete winner Tsegaye Kebede with the Ethiopian flag after being awared for winning the Virgin London Marathon. The British Universities and Colleges Sport (BUCS) rugby day at Twickenham Stadium saw Durham University and Cardiff Metropolitan University meet in the final at the university rugby showcase held in Twickenham Stadium. Durham University beat Cardiff Met 26 – 17 to reclaim the championship title. Samsung relay promoters arriving in style to hand out freebies to the crowds. The relay happened on a Sunday morning. So there was a lot of praise and worship singing before the torch arrived. Harlequins Rugby Union players l-r: Nick Evans, Chris Robshaw (c) and Mark Lambert at the Etihad stand at WTM 2011. If there is one thing I have learnt about doing editorial photography, is the importance of photos being used much later than the day you took it. A good example is when Chris Robshaw, captain of Harlequins Rugby Union, was named England’s new skipper for the 6 Nations Tournament for at least two of their matches. I quickly realised that I had photos in my archives that I could use as file images. This image and those in the gallery access were taken during World Travel Market at the ExCel Centre, London on 7 November 2011. The players happened to visit their sponsors stand, Etihad Airways and were happy enough to do an impromptu photo call. The 6Km Santa Run is held on the first Saturday of December for charity. This year the event was organised by 2:09 Events to raise funds for Disability Snowsport UK, a national charity that helps people with disabilities to access the thrill of snowsports. The Santa Run was held at Battersea Park on 3rd December 2011. People of all ages joined in fun and ran around Battersea Park dressed as santa.